My father drove about 160 miles roundtrip everyday to work and owned a series of dull economy cars throughout most of my childhood. In the fall of '85 though, he walked into the small Honda dealership we had in Springfield, Ohio where I grew up and bought the coolest car he ever owned. 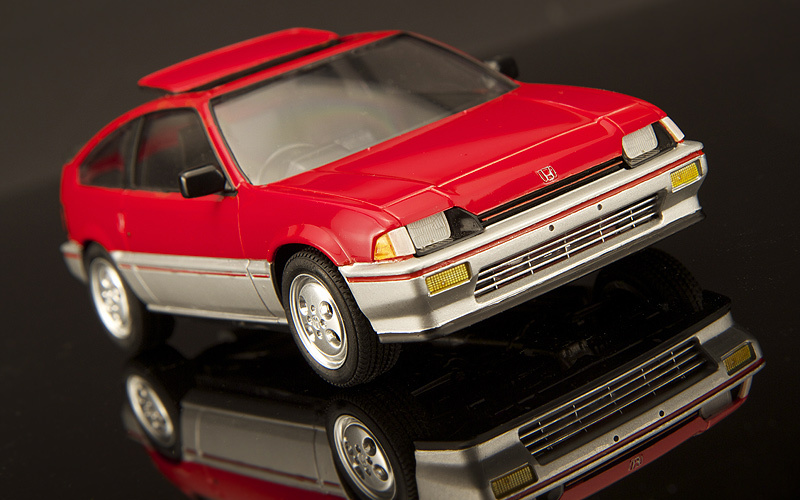 He bought a brand new bright red '85 Honda CRX Si. Now, you have to understand, buying the CRX was out of character for my dad. He was not particularly a car enthusiast like myself, so when he brought home the Honda I was shocked. He had previously owned a VW Beetle, a Corolla and a Vega. 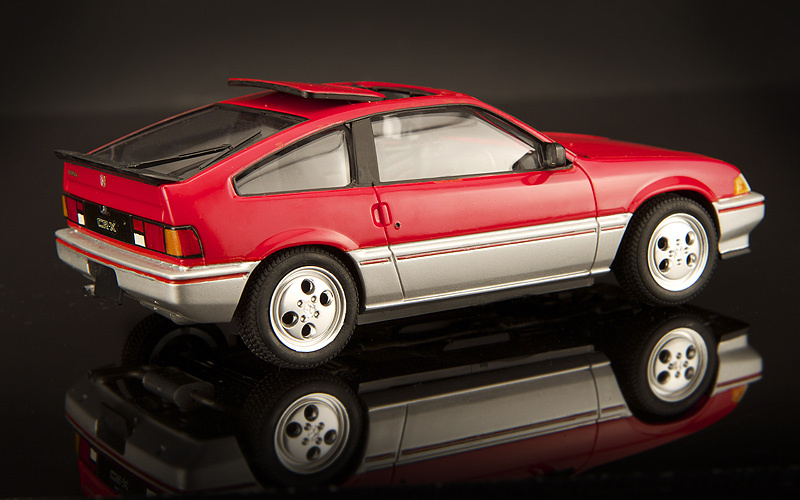 In comparison the '85 CRX Si was a true sports car. I was about 18 when he got it and I loved borrowing the keys to it. 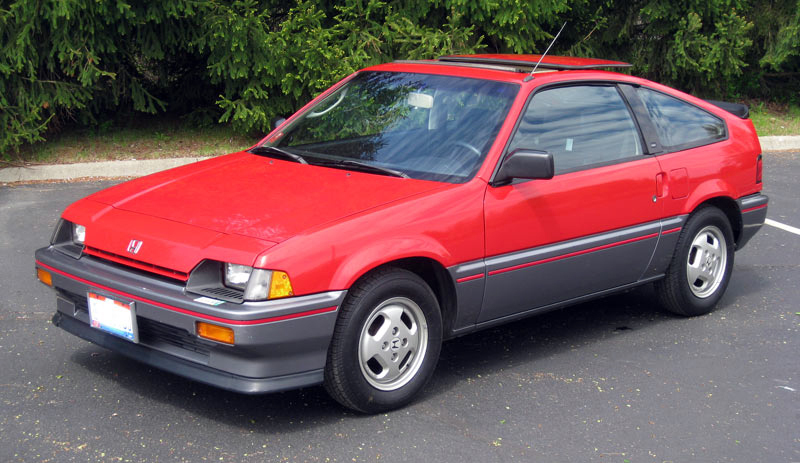 I remember savoring drives in the CRX and I loved blasting around our back country roads with the sunroof open. 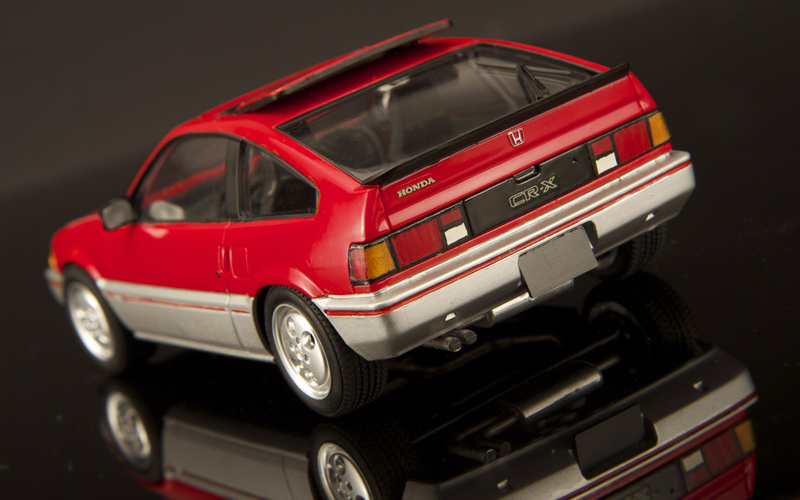 His Honda CRX was an absolute rocket and was the first car that got me excited about hot hatch imports. My dad took an early retirement a couple of years after buying it so his CRX Si was saved from the high mileage daily drives that killed the other cars before it. He loved the little Honda and kept it in excellent condition until the summer of 2014 when he decided to finally let it go. 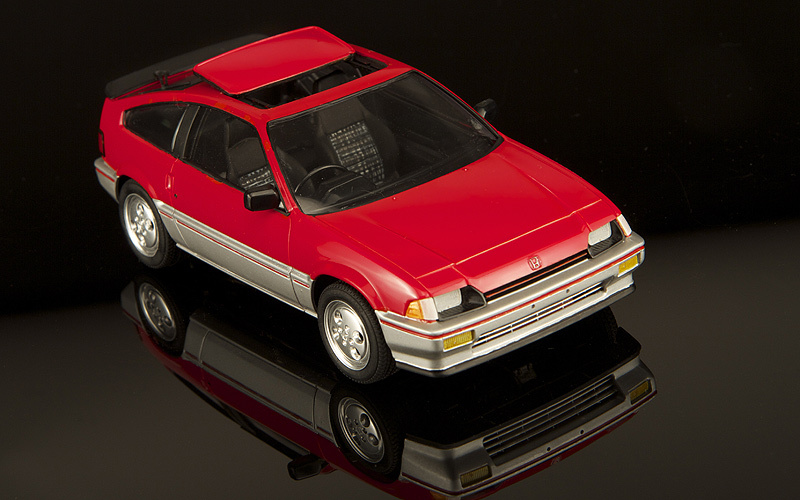 Back in '86, I built this replica of his Honda CRX for his birthday that year. I built it using the 1/25th scale Tamiya kit and built it straight out of the box. 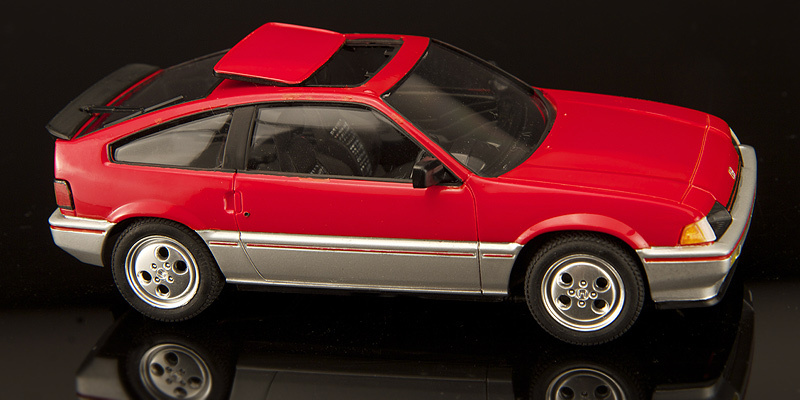 The Tamiya kit is very nice and is very close to my Dad's car except you'll notice it's a right-hand drive Japanese spec car and has the Japan market alloy wheels. American cars had a slightly different rectangular hole wheel design. The model sat in a plastic showcase on his dresser for 28 years before it finally got broken in an accident. I recently repaired the model and it will go back to stay with my Dad. While I had it, I also polished it up and photographed it for my web site. 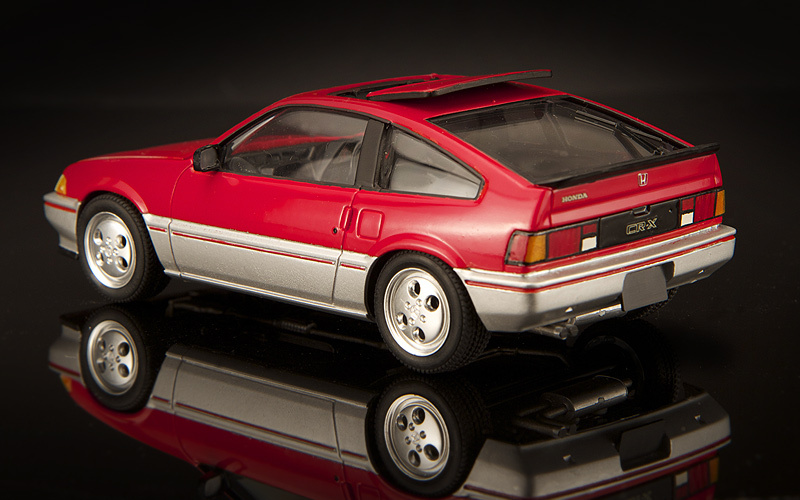 This CRX is one of my oldest surviving models. I hadn't really paid attention to the model for many years and I found it interesting to inspect it. It's a time capsule of sorts of where my modeling skills were back then. Here is a photo of my Dad's real 1985 CRX Si. Before my he sold it, I got to spend a few weeks driving it around the town where I live now. It still felt tight and solid. It was still the fun little car I had remembered and turned heads everywhere I went. For a short while I was 18 again.